July is Spanish literature month and Stu over at Winstonsdad’s Blog and Robert at Carvana de recuerdos are co-hosting this fantastic event. Visit their sites to see which bloggers are participating and to read lots of great reviews of books by Spanish authors. 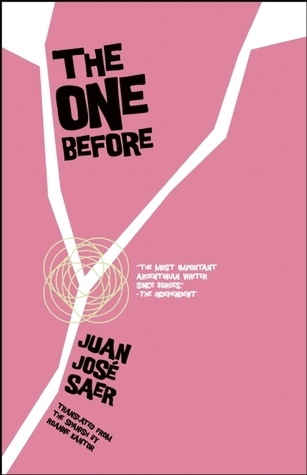 I chose as my first book The One Before by Juan Jose Saer, an Argentine author; this copy was given to my by Open Letters Press via Edelweiss and is translated by Roanne Kantor. This collection of stories do not necessarily have a plot or read like traditional stories. They are more like intense philosophical observations made about various aspects of life by the author. The book is divided into three sections, the first of which is called “Arguments.” The “Arguments” are short pieces that range from one to three pages and include the author’s thoughts on a variety of topics such as insomnia, geography, dreams, existence and memory. The procession begins immediately, the mute creaking of insomnia, interwoven with changing forms that assault me and never leave until daybreak. Almost always, it ends with increasingly wild disintegration, whose final phase I forget most of the time, or perhaps I’m already asleep, or perhaps I believe that I’m already asleep, or perhaps I’m absorbed in a thought of which I’m not conscious, but that nevertheless I believe I understand. Even if we don’t have chronic insomnia like the author, everyone at one point in life experiences a sleepless night or two. The meandering, almost frantic, prose of this story relates perfectly the panic we feel when we cannot sleep and toss and turn and wonder if sweet drowsiness will ever come to us. Also, as Pidgeon is trying to leave Argentia, there is a rising flood that keeps threatening to overtake his home town. The army is desperately trying to do what they can to save the city and the suspension bridge that connects the city to other parts of Argentina, but the flood shows no signs of stopping. I wondered if this flood is a metaphor for the political regime that swallowed up Saer’s native land, so much so that Saer never felt like he could return and died in exile in Paris. Pidgeon also seems to have a crisis of identity due to the fact that he has an identical twin named Cat. People are always mistaking him for Cat and we can’t help but wonder if part of his reason for fleeing to Europe is to try and discover his own identity and become his own man. At one point his visits Cat at his home but Cat is not there. Cat’s roommate, a man name Washington talks to Pidgeon but the entire time Pidgeon keeps wondering if Washington realizes the difference between the identical twins. These stories are stream of consciousness writing, sometimes rambling, and oftentimes profound. Saer’s prose is abundantly descriptive and he is fond of the long sentences which use little or no punctuation. This is a short book at only 130 pages, but it took me a few days to read it at a slow pace so that I could understand and absorb Saer’s thoughts and ideas. I highly recommend giving Saer a try if you are interested in Argentine literature. Juan José Saer was one of the most important Argentine novelists of the last fifty years. Born to Syrian immigrants in Serodino, a small town in the Santa Fe Province, he studied law and philosophy at the National University of the Littoral, where he taught History of Cinematography. Thanks to a scholarship, he moved to Paris in 1968. He had recently retired from his position as a lecturer at the University of Rennes, and had almost finished his final novel, La Grande(2005), which has since been published posthumously, along with a series of critical articles on Latin American and European writers, Trabajos (2006). Saer’s novels frequently thematize the situation of the self-exiled writer through the figures of two twin brothers, one of whom remained in Argentina during the dictatorship, while the other, like Saer himself, moved to Paris; several of his novels trace their separate and intertwining fates, along with those of a host of other characters who alternate between foreground and background from work to work. Like several of his contemporaries (Ricardo Piglia, César Aira, Roberto Bolaño), Saer’s work often builds on particular and highly codified genres, such as detective fiction (The Investigation), colonial encounters (The Witness), travelogues (El rio sin orillas), or canonical modern writers (e.g. Proust, in La mayor, or Joyce, in Sombras sobre vidrio esmerilado). His novel La ocasión won the Nadal Prize in 1987. He developed lung cancer, and died in Paris in 2005, at age 67. Roanne Kantor is a doctoral student in comparative literature at the University of Texas at Austin. Her translation of The One Before won the 2009 Susan Sontag Prize for Translation. Her translations from Spanish have appeared in Little Star magazine, Two Lines, and Palabras Errantes. Saer is on my list of writers to read after reading this I must try and get a book by him . I would like to read some of his longer works now as well! Saer’s one of my favorite writers, Melissa, but I’ve only read novels and literary criticism by him and only one short story or two (I’m working through his novels in chronological order). I like how you described the one story as being comprised of “meandering” but “almost frantic” prose because Saer’s stream of consciousness, while challenging at times because of its digressions and its philosophical ruminations, can also be quite hypnotic. Anyway, thanks for the post and the info on what Saer’s short stories are like; I had intended to read them once I finish his novels, but maybe I’ll dip into them earlier than that! Thanks so much for your comments, Richard. After getting a taste for Saer through his short stories I am very interested in reading his novels. Is there one in particular that you would recommend I start with? My favorite Saer at the moment is a 1974 novel called El limonero real, but it had yet to make its way into English the last time I checked. Of his translated titles, I’d go with either The Sixty-Five Years of Washington (a somewhat challenging work but one which many consider to be his very best) or the somewhat more straightforward Scars (an early work which is somewhat Dostoevskyan). Many of Saer’s novels feature recurring characters w/Saer’s Santa Fe, Argentina being something like a universe unto itself like Faulkner’s Yoknapatawpha County. Thanks so much for the recommendations! I think I will try Scars first. I like the “intense philosophical observations” that I often find in Spanish literature. I am reading A Heart so White by Javier Marias, and I am reading it very slowly as I feel he has much to say behind his observations. They are not simply of an outward nature, but more of the workings which go on in our minds. As for the insomnia, I don’t suffer from it typically, but when I do I can totally relate to the distress in the paragraph you noted. I’m glad to be aware of another Spanish author of whom I wasn’t before this wonderful event. I fill have to look at Marias as well, thanks for the suggestion. This is a great event and has made me look closer at Spanish lit. and I have found lots of great recommendations! I read a couple of Saer’s novels when they appeared in the UK years ago (The Event and The Investigation) and always intended to read more – I have Scars and should really try to read it this month. This sounds like an interesting collection though – I’m glad Open Letter are making more of his work available in English. Hi Melissa – i have been reading some of your posts. I love your blog. I like your reviews as well as your choice of books. This collection sounds very good. I love philosophical fiction. The plots of the stories sound interesting. In addition, I tend to like unconventional styles such as stream of conciseness if only because i sometimes long for something different. I have never read Jose Saer but now I would like to. Hi Brian! I love your blog as well, you pick the same types of books I love to read. I have been wanting to read Trollope’s Barsetshire series as well, great review! I missed Spanish literature month. but I will soon be reading ‘The Gods of Tango’ by Uruguayan writer Carolina de Robertis. I previously read and was much impressed with her novel ‘Perla’. Spanish Lit. month has been a great event and I’m so glad to have found it on Stu’s blog. I have learned about so many Spanish authors, my TBR piles are overflowing! One, of the many, things that I love about Spanish Lit Month is being exposed to such wonderful and new-to-me authors. I’ve just picked up Fuentes from the library, can’t believe I haven’t read him yet, nor have I read anything by Saer. So happy to begin reading these authors! I completely agree–Spanish Lit. month has really added to my TBR piles!